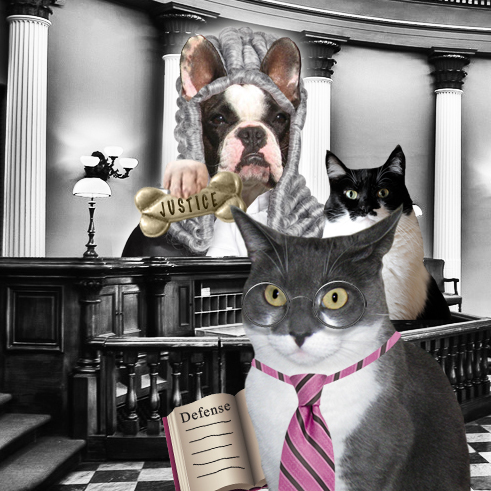 It's the home stretch for "Katie Is...ACCUSED" in the frenzied race for Purina's 'The Friskies' Best New Internet Cat Video of 2012. Voting closes today, Friday November 9 at 12:00 noon, EST. If there's anyone on the planet you know hasn't voted yet...human, feline, even CANINE... as long as they have an email, it's time to strong-paw them! Today, most appropriately, we are going behind-the-scenes with my only lead attorney, the Stunning Counselor Cathy Keisha. KATIE: Ms. Keisha, what was your favorite part of the video? CK: The parts with me in it, of course. CK: TW loves Gloman's voice but who cares what TW loves. KATIE: Yeah well, TW has never heard Gloman rip into the TV ads and losing football team here. I'm pretty sure I'm suffering from permanent nerve damage. CK: The plot. The plot holds the viewer's interest, IMSO. KATIE: What are the other animals in your house saying about the video? CK: All the stuffies around here are my political enemies so they're jealous and said they won't vote for it. There are gonna be a lot of stuffies going down the chute today unless they change their minds. KATIE: Never trust a stuffie. Ok, Ms. Keisha, the $15,000 question...Guilty or Innocent? CK: Who you looking to blame for this? I'm innocent due to my not being guilty. Oh, you're talking about Katie. CK: I'm KATIE'S LAWYER! Of course she's innocent. KATIE: *phew* Ok Ms. Keisha, any final thoughts? CK: I'd like to make a closing statement to the jury. This case has dragged on long enough. I'd like to ax you to ignore all the lies you're heard from the Prostitutor--Whatta you mean, objection? Sit down you liar?--and his witnesses. Did any of you see any spit on that shoelace? I didn't think so and IF THERE IS NO SPIT, YOU MUST ACQUIT. Now look at my client. The innocent look, the pleading little kitten eyes, and ax yourself if she could've done what she's been excused of. On the other hand, look at Gloman. A grown man, who doesn't know enough not to leave his sneakers all over the floor. He's got a cat, a sweet, innocent little cat and yet he entraps her cos he knows that a cat is going to be curious. 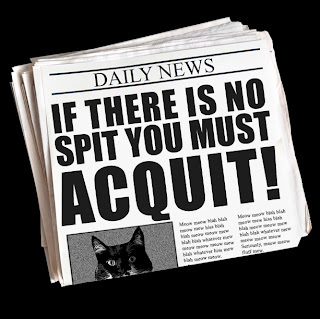 No jury of cats can find her guilty of BEING A CAT!! I find Gloman guilty of negligence and breaking Cat Rule #97 as put forth by Sparkle Cat: "Anything left on the floor any length of time whatsoever is considered property of the cat, and the cat can use it for any purpose deemed appropriate." Katie broke no rules and must be released NOW. Thank you. Thank you everybuddy for all of your votes, shares, shameless pulgs and support. We love you SO much and the joy you bring to us is better than any award, EVER. Voting is closed and now we wait with paws joined and crossed. Where's Waffles. I came looking for Waffles. What's up with Waffles? Great defense, CK! I bet the prostitutor didn't know what hit him. 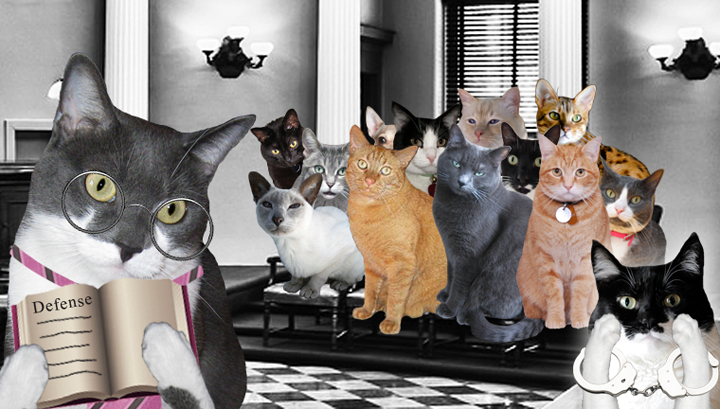 My human will be keeping her fingers crossed for you at the Friskies Awards next week! Great argument! Efurryone knows if it's on the floor, it must belong to the cat. KATIE IS INNOCENT! Innocent! Free Katie Free Katie! Yep Katie is innocent. How could she be not? Have a fabulous Friday. Katie's INNOCENT! And yeah, where's Waffles? Very convincing closing argument, CK! We're on the jury and we say Katie is INNOCENT!!! pee ess. we voted every which way from Sunday...we sure hope Katie wins. Wow! Ms. Cathy Keisha is the kind of attorney I want on my side! She's certainly raised a reasonable doubt! I'm not sure what I'm doubting, but I'm sure Katie is innocent! Look at that sweet little kitty. How could she be anything but innocent. We forwarded yesterday's blog from Queen Penelope to everyone on our contact list. I've heard back from a few and they enjoyed your video and voted for it. Nah, never mind, whoever set Miss Katie up would've hada be a mastermind. I've got a wild imagination. You can never argue the law of a cat being a cat. It's just in our DNA and CK made an air tight case! 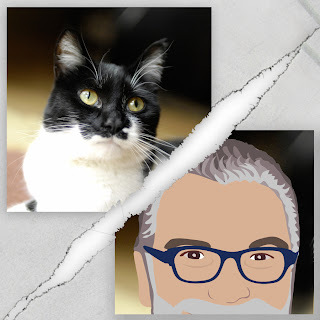 Let's stop wasting our precious money on this trial and get back to buying cat toys, catnip,salmon, and, in my case, more jewels and tiarra's. What's this about stuff being on the floor. EVERYTHING in the house is mine. No matter where it is. The judge probably knows this and is just dragging this out because he's a dog. best fishes two ewe katie N hope ewe haza grate week oh end az well !!! Great closing, CK. Katie is innocent! We voted, and have been encouraging others to do the same. We SO hope you win! I so hope you win, all paws crossed! I'd like to thank Katie and GG for giving me a chance to stretch out my acting skills by being a lawyer. I had to act, something I don't in my usual roles of a stunning diva. I've been wondering about that funny-looking kit that plays Juror #10. The kit with the big nose. I mean, what kind of cat is she. She's a bit on the … well, how can I put this … a bit on the, you know, ugly side for a cat. What a dog! Don't get me wrong, she's cute for a dog. Well, whatever. As long as she votes to acquit. We've got everything crossed for you Katie. Good luck!!! Oh theese one is a good one! That CK is somefin' else! And with a closing argument like that, how could it not go in Katie's favor? Our paws are crossed for your video win!